How do I stop the "Equipped" label from changing colours after being hovered over in the backpack? Also, how do I change the appearance of the default weapon panels? I've looked through clientscheme, but have been unable to find the appropriate field. How do I stop the "[url=http://i.imgur.com/SGsq3kX.png]Equipped[/url]" label from changing colours after being hovered over in the backpack? 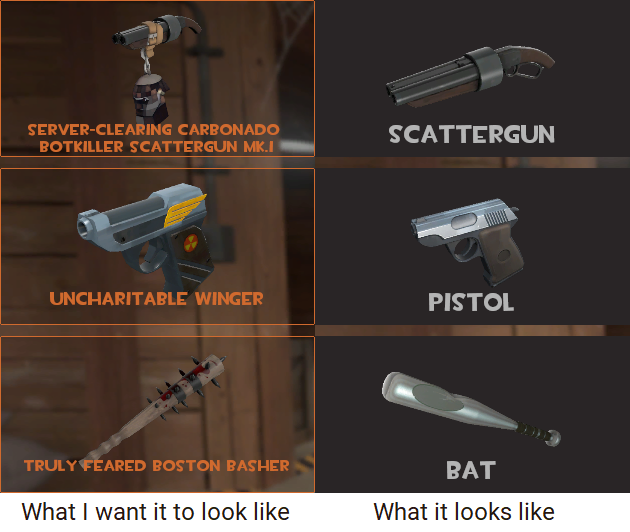 Also, how do I change the appearance of the [url=http://i.imgur.com/G46YuV2.png]default weapon panels[/url]? I've looked through clientscheme, but have been unable to find the appropriate field. 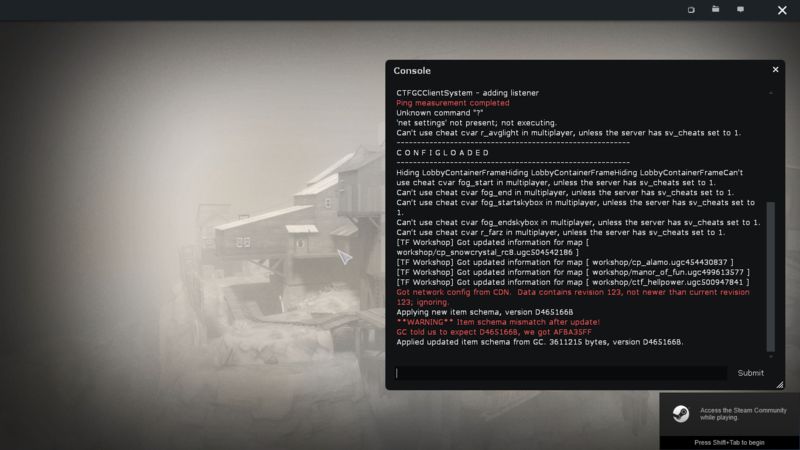 I'm trying to change my server time left value font i changed it but when i reloadscheme and open the scoreboard it shows the font but after 2 seconds it reverts to the tf2 font. 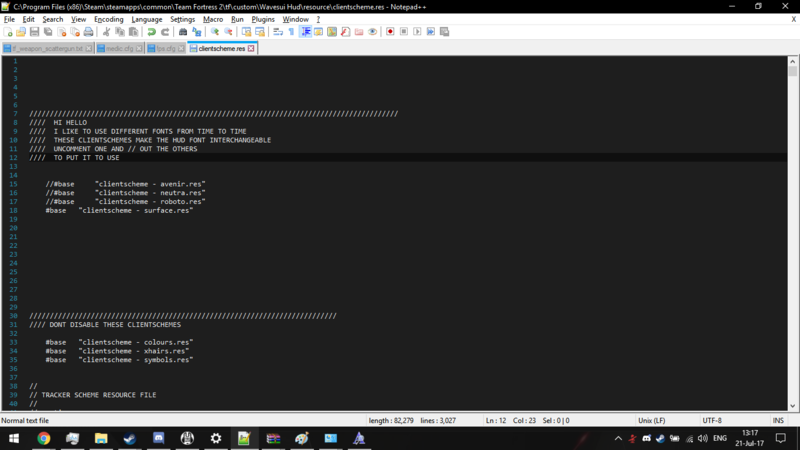 Change the ControlName to not be the default name for the element, then TF2 doesn't mess with the font anymore afaik. 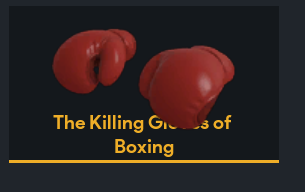 anyone know why the text is under the model? z-pos of the model might be higher than the z-pos of the text. Koncept f2s4x1oHow can I remove these 2 objects and move the panel between them? [quote=Koncept][quote=f2s4x1o]How can I remove these 2 objects and move the panel between them? 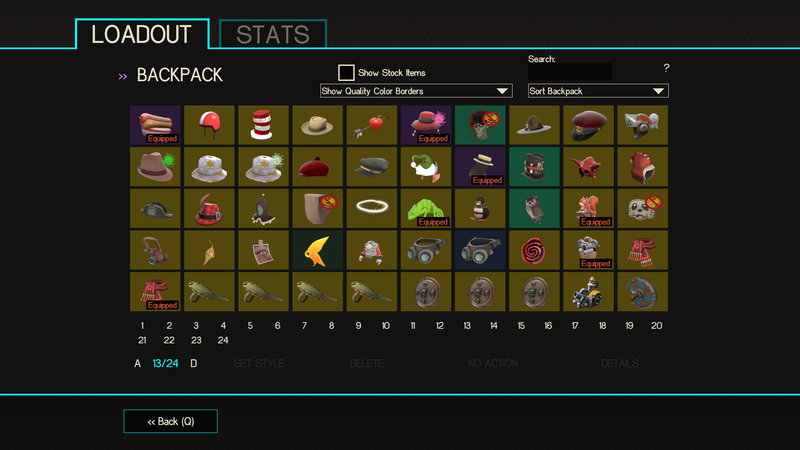 So I got rayshud from cfg.tf, but I want the character showcase back then im playing, you know, this thing http://prntscr.com/fvaq9g since I like my hats too much and i miss it, is there any way i can get it back while keeping rayshud? the casual bar where there is the time and the players is messed up in my hud , what res file is the casual thing so i can fix it ? If you want to get rid of the name, score, and ping, you'll be working in the "scores" field usually found at the top of the file. The the fields ending in "_width" are likely what you're going to be working with. 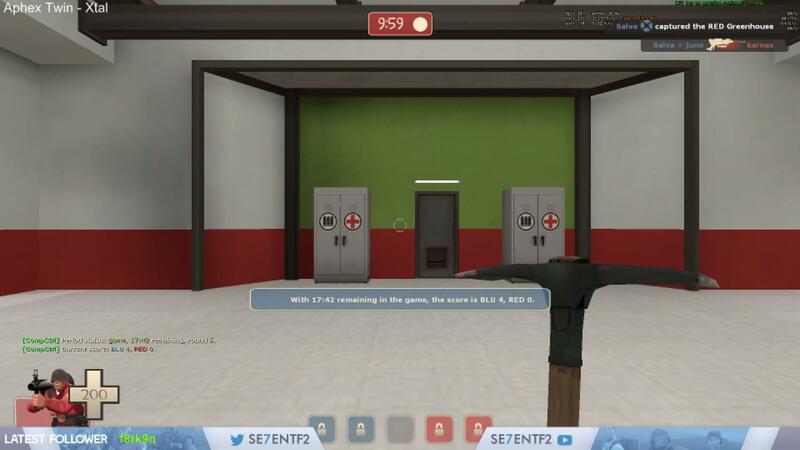 Question of my own: Is there something coded into TF2 that prevents target IDs from being moved along the very center of the screen? And is it possible to override it? #4486 Play with Button.Bgcolor, Button.ArmedBgColor and so on in clientscheme. #4487 Just take it from another hud. tnm#4486 Play with Button.Bgcolor, Button.ArmedBgColor and so on in clientscheme..
On a second question, anyone mind sharing how to enable valve competitive mode with bots? or some way of visualizing the competitive ui in-game? replaying demos doesn't work. Does anyone know where I can locate the uber charge numbers for ahud? WizardTF2Does anyone know where I can locate the uber charge numbers for ahud? Check hudlayout.res and search for "NotificationPanel" and check that it's not disabled with a visible/enabled value of 0. How do I change the control point icons to a straight line like this? Have a look at this thread; it's a texture modification, which doesn't work in servers that aren't sv_pure 0. Have a look at [url=http://rebelconquer.net/41608/how-do-i-make-my-cap-points-look-like-this#10]this thread[/url]; it's a texture modification, which doesn't work in servers that aren't [i]sv_pure 0[/i]. but the font looks NOTHING like m0re what so ever or how it looks in the screenshots, help? Go to the fonts folder and install the font. http://imgur.com/a/FtuUL Go to the fonts folder and install the font. How exactly would i do that? 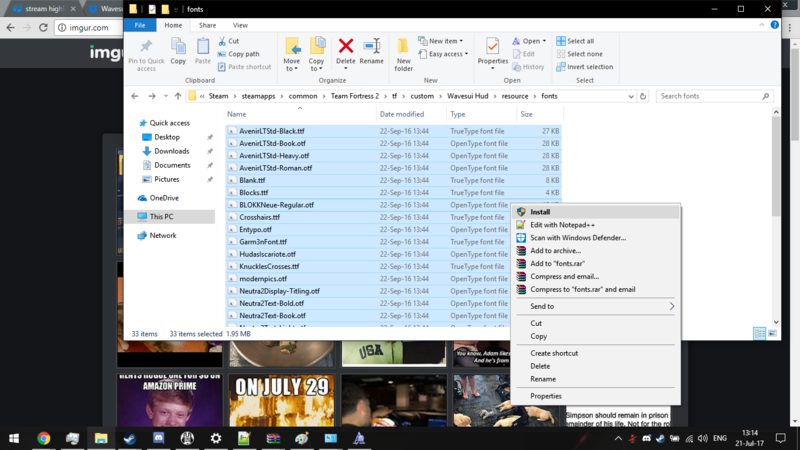 there is like many font files in the font folder, not sure which to install. SkyH4ighHow exactly would i do that? Go into the folder, select all (ctrl+A), right click, and hit install. [quote=SkyH4igh]How exactly would i do that? HappyseditsSo I got rayshud from cfg.tf, but I want the character showcase back then im playing, you know, this thing http://prntscr.com/fvaq9g since I like my hats too much and i miss it, is there any way i can get it back while keeping rayshud? It should pop right back up again.